It's interesting that the Longwood Road Streetscape Plan has a picture of a proper bike box with coloured pavement in the lane and the box. Our own city cycling committee is lobbying the province to make the 'official' bike box design in Ontario similar to the one they installed at Aberdeen and Studholme. Oh, did you not notice there's a bike box at Aberdeen and Studholme? That's because it's invisible. 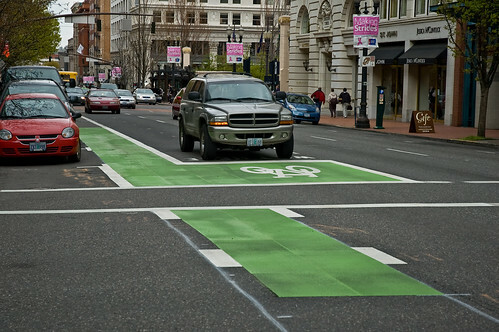 A bike box, or "advanced stop line", is a marked spot on the street before an intersection that allows cyclists in a bike lane to pull ahead of automobile traffic at a red light so they can safely turn when the light changes. In most cities around the world, bike boxes are framed and painted bright, solid colours so their purpose is clear to cyclists and motorists alike. Not in Hamilton. Our bike network planners worry that painting a bike box will make cyclists unsafe in the rest of the city. As a result, the bike box is not painted and you can barely see it. Setting aside the question of whether this fear even makes sense, it has the effect of setting an impossibly high bar to make any change to the way we denote cycling infrastructure. Either we change the entire city at once, or we're stuck with the lowest common denominator. It is a great idea but as you said Hamilton has failed by not painting the box. This, of course, does not surprise me whatsoever. There used to be a bike painted in the box at Aberdeen and Studholme. Then it mysteriously vanished. Now I am never sure where to put my bike in order to get the light to change, so I don't even use it. What a waste! If you pretend you are going to turn right on Aberdeen, you will trigger the sensor. I do it every day on my way home. Why would the city's cycling committee, responsible for representing the interests of cyclists to council, lobby for a watered down standard? It's not like we're talking about the Roads and Traffic department here. This is the cycling committee. Their whole reason for existence is cycling. It's like they've been told NO so many times, they've given up trying to ask for anything big. So they are defeated then? Is this how a committee should act? Shouldn't every defeat make them louder and stronger in their approach, voice, and actions? The current configuration is confusing - I've sat there on my saddle and in the driver's seat, in each case wondering just where exactly I'm supposed to be. Please include the Cycling Committee with your letter. Sadly, they are pushing for these completely useless, watered-down bike boxes to become the provincial norm, instead of the world-wide norm shown in the photo in this blog entry. Why learn from everyone else, when you can water down good ideas to the point of being completely useless? Status quo, baby. One thing missing from the thousands of photos in this search - Hamilton's style bike box. Either regular bike boxes actually work, or every other city on earth, except Hamilton, has no clue what they are doing.